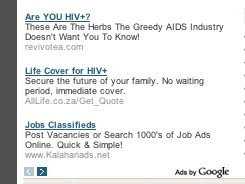 I saw these google ads today on a South African news website (timeslive.co.za). I rarely look at AdWords (consciously anyway) and almost never click on them. But this time, I did. The ad that grabbed my attention is the first one - for a herbal remedy called revivotea. I have worked on media and communications aimed at reducing the HIV and Aids epidemic over many years and this kind of message makes me mad. Clicking on the link made me even madder. There you can find 'tesimonials' claiming that people's 'viral loads' had gone down to undetectable levels and including statements like: "no more visiting the doctors 3 times per week now after taking Revivo", and "With this booster I don't think people should be afraid to die of Aids anymore . It is expensive but it's worth it...". When misleading advertising is about HIV it's not just about consumers getting ripped off. It means life and death. So I decided I wanted to complain to someone. If this ad had run on the site's sister newspapers, the Times and the Sunday Times, I could get it removed by writing an email to the South African Advertising Standards Authority. I'm pretty confident that the ad would be in contravention of its Code of Conduct. Amongst other things, for example, the code states that "all claims, whether direct or implied" must be capable of substantiation with documentary evidence. I would greatly doubt, based on its previous rulings, that the ASA would take these testimonials as sufficient 'proof'. Nor would they be likely to take seriously the user 'survey' on the site which would appear to fall foul of the ASA Code since it does not appear to have been conducted according to SA Market Research Association standards. The Code is part of a self-regulation system run by ASA. ASA's members include the newspaper publishers association, broadcasters and marketers. AVUSA, publisher of the Times and the Sunday Times, is a member of the newspaper publishers association. Interestingly the Online Publishers Association (which AVUSA is also a member of) are not members. So as far as I can see the code does not apply to online advertising. I could write to AVUSA. But of course, though AVUSA sells and controls the ads that appear in its newspapers, it doesn't sell or control the ads that appear here. They have been placed by Google's AdWords. So I could write to Google. Google also has advertising content guidelines. Under 'False health claims', the guidelines state that AdWords 'prohibits false health claims in ads.' But I'm not sure the ad's wording does make a claim. The guidelines also state that if "an ad or landing page contains a testimonial promoting atypical results, there must be a clear and conspicuous disclaimer specifying the endorser's unique circumstances or there must be valid third party verification." But the testimonials don't appear in the ad or the landing page (the writer of the home page appears to have taken care not to mention HIV or AIDS). The only guideline I could find under 'False health Claims' that might be relevant to getting the ad removed is the following: "Ads must comply with all applicable laws and guidelines (such as the FDA, FTC and equivalent regulatory bodies)." Though again, I'm not sure. Is the ASA a 'regulatory body'? It does create regulations but these are part of a system of self-regulation imposed only on its members (Google is not a member). After some research I did find grounds for asking Google to remove the ad under a different section: 'Misleading and inaccurate claims' where it states that 'Google AdWords prohibits the promotion of websites that make claims that are either scientifically impossible, or otherwise extremely misleading to users'. I have now written to Google to ask that they remove the ad. (You can do this too).Though even here there are significant differences between the mass media situation and the online. If I had complained to the ASA I would be informed of the result. Google states that they will not respond to my complaint, but will investigate the matter. This brings me to a second interesting issue concerning internet vs 'traditional' mass media advertising. How ads are 'served'. What led to me getting two ads today that relate to HIV - not something that's happened before? How this happened I don't know and won't know, in detail, but Google does tell us that it uses three methods to place ads. First, 'contextual targeting' which aims to identify relevant pages for an ad based on the links of a page and some features of its content (The Timeslive site has a dedicated section on HIV and Aids). The second is placement - where the advertiser chooses the sites it wants its ad to placed on (as it does with traditional advertising). The third is by profiling users. When I saw this ad, I was signed into igoogle. I don't know whether or how this affected the placing of the ad. But it may have, and this means I may never get the same adwords that I received today, so I might never know whether the ad has been removed. The ad itself is not in fact public in the way that traditional advertising is - I can cut and paste a picture of it as I have done on this blog but I can't direct you to it. In fact, when I returned to the page, the ad wording had changed, replacing the reference to the 'Greedy AIDS industry' with 'They'. The third interesting thing this ad shows is the changing face of Internet users in South Africa. A year or two ago I don't think a herbal HIV remedy would have used the internet to reach its target market. But last month South Africa hit five million Facebook users (growing at 11% per month). For the first time we are seeing ordinary working class South Africans online. So what does all this tell us about convergence in Africa? I think its an example of how complex it is to judge the public benefits of the Internet, especially in an environment like South Africa's. As an Internet advocate, I argue in many forums how important it is to empower the majority with the access to the information and cheap communication that the Internet offers. I am a board member of South Africa's Freedom of Expression Institute and one of the reasons I advocate on behalf of the Internet is that it offers the possibility of the democratisation of freedom of speech (which includes paid for speech). But this democratisation has a price. Google is not the bad guy here but 'Do No Evil' is in fact a very difficult standard to hold yourself to. But in reality we need to balance good against evil. 20th Century mass media offered controlled content, self regulation, a few voices and many (nation bound) listeners. The Internet offers many voices, no coherent regulation (for better or worse) and global conversations. So I now have to trust Google to do the right thing (knowing how difficult, if not impossible a standard that is to meet on a global basis) rather than trust a cabal of local media owners. I'd like to trust the Internet vs the mass media but, ironically, given the apparently open nature of the web, the decision-making on whether to allow this particular example of (evil) free speech or not, is far less transparent than it would be in the mass media structures of self-regulation. I may never in fact know what Google has decided to do. But what ever sanction Google imposes on Revivotea, the fact these quacks are advertising shows that the Internet is working in South Africa, not just for the rich but for the majority of working class South Africans. And, overall, I continue to believe that, once those people learn to engage with the opportunities of online communication the discussion that emerges will counteract lies more effectively than any regulatory system. I hope I am right.